No. 538, Omega House, Opp. Gas Land, Molete, Ibadan. This is a glimpse into what My team and I have been engaged in for some years now. It has been very impacting, life changing and challenging to make a difference in a world filled with many obstacles and challenges. You can be part of this team or support the work we are doing within our community and beyond. You are very Welcome. House of Refuge International is a church being pastored by my wife, Olutoyin and I. It is a dynamic and growing Church in the city of Ibadan. The Church is planted in a core area of Ibadan known for violence, alcoholism and prostitution. The Church is committed to Discipleship, Evangelism and Worship and to be a light to the Nations. Leadership Development is our Core and this is the main objective of our outfit, Leadership Development Centre (LDC) with a vision of “Raising Leaders and Transforming Nations”. We organise workshops, seminars and conference to raise proven and visionary leaders with integrity and sound character in Transforming our Cities and Nation. Olufemi Ajani is a trained IT professional with 12 years of Experience in the Banking World before he resigned in 2016 to focus on Ministry and his life purpose. Since then, he has taken Digital Ministry as a calling reaching out to the body of Christ on the impact and Importance of Digital Ministry to 21st Century (Digital) Generation. He speaks regularly in Seminars and Conference within and outside Nigeria. We existing to give God pleasure and establish the Kingdom of God on the earth. The Church cannot be separated from the community, we are meant to shine and make the glory of God known. From time to time we carry out Community Development Projects meeting the needs in our communities. We establish School with highly subsidized fees to accomodate the pupils whose parents are low income earners or artisans. Signup for latest information and updates from DMA! You have successfully joined the subscriber list of Digital Ministry Academy (DMA). Kindly check your mail for the welcome Note. 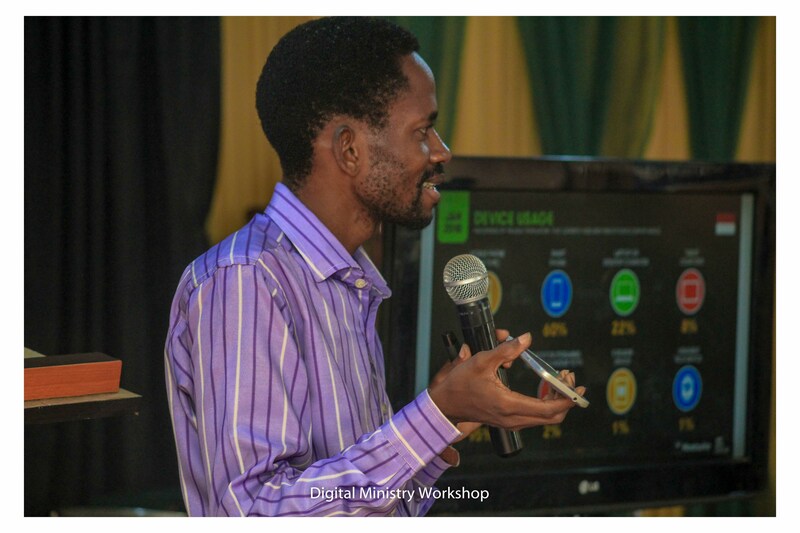 Faces at Digital Ministry Workshop on 6th April, 2019. I believe in God and in His Son through the working Power of the Holy Spirit and this is the force behind all I do. We are change agents on the earth to transform the lost world back to their maker. Join the winning team and let us do the work together.God bless. Olufemi Ajani is a tranformational speaker whose love and passion is to add values to his audience both in the spiritual and the secular space. He is a pastor, a coach and a trainer, an author and an enterprenuer. He finds joy in sharing knowledge and impacting lives to leave people better than the way he meets them. He speaks to provoke peoples minds towards change and transformation. He coaches and mentors the upcoming leaders and entrepreneurs while he also opens himself to learning from others. He is the CEO of Leadership Development Centre (LDC), an outfit for raising and developing leaders and entrepreneurs to create a better life for the community. He is an ICT professional for over a decade and retired voluntarily from banking after 12years of a successful IT career to focus on his life’s passion. He is happiy married with 3 girls, and he lives in Ibadan. We have this strong belief that the sovereign God created all men (all of us) for a divine purpose and it is so important that we discover the creator's intention for our creation for us to fulfill such purposes on the earth. Have you discovered yours? June 16th, 2017 remained a remarkable day in history in Molete community. It was a day to celebrate the day Olufemi Ajani added another year to his years and the grand commissioning of Molete Water Project sponsored by Covering Eagle Foundation under the President, Daniel Adebayo Omonira and commissioned by God’s servant, Rev Samson Ajetomobi, the President of Men of Issachar Vision INC, Ibadan. The event was witnessed by the members of the community, the landlords Association of Molete community, the entire members of the Church, House of Refuge Intl, the media crew and the well wishers. Molete has been a place known for violence, drugs, alcoholism and a strong political base in the city of Ibadan. In the pas, it was like a lion’s den, the fear of the place still dominates many hearts today. Young men are used as instrument of violence during political campaigns and this has made the environent unsaved then, bit all thanks to God, the stories are changing now. A great day indeed that a major generational problem was permanent solved in Molete Comunity. Inability to access portable water was the major problem we met in Molete in 2014 and through the help of God and the support of friends with our major sponsor, Covering Eagle Foundation, the Water project was commissioned on my birthday, 16th June, 2017. There can be better life for everyone. No one should be disadvantaged in life based on his or her background, loction or status. We provide relief materials and free medical services to those in the remote areas where such services are not available.